My mom picks Jake up after school since I'm still at work when he gets out. She has to drive through a "pick-up" line with a sign on her dash given to us by the school, which has Jake's full name on it. A teacher then walks through the car line with a two-way radio, calling of the names of kids coming up in the next group of 20 or so cars. Several times during this process the last year or two, Jake's name has been called and he hasn't come out to the car. They eventually find him, sitting at a table where he's supposed to be, but unaware that his name was called. The first time everyone panicked. For about 30 seconds they thought he was lost. This happened again last week, and when I asked Jake what happened, Jake said "Sometimes the other kids just get too loud, and I have to shut my ears off." I was fascinated by what he said, because he's never been able to put the experience into words. He has a hard time recognizing how he feels or expressing anything but concrete concepts. Essentially what happens is that Jake gets sensory over-loaded (too many signals being brought in by his senses all at once) and as a coping mechanism, he blocks one or more out. Now there's Auditory Processing Disorder, where there's nothing wrong with a child's hearing per se, but what they hear doesn't make it to their brain (or gets there, and can't be interpreted correctly) - and I sometimes have thought Jake has a smattering of APD - but in this case I think that for whatever reason, he just can't deal with an excess of commotion. However his brain is processing and organizing sensory information, it just can't keep up - so it shuts that sense off instead. Earlier this year, Jake and I started reading the first Harry Potter book together, and once we were half-way through the book I let him watch the first movie. During the 3rd or 4th time we watched the movie, when it got to the part where we first see the Dursleys, Jake emphatically said "I wouldn't want to live with THOSE Muggles." Jake: I made a new friend named Alex. He has red hair. Me: Oh now you know 3 red-heads: Alex, Tyler, and Zach. Yesterday we had a snow day - middle Tennessee actually got 4 inches of snow! (This happens next to never.) 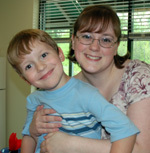 Being a homebody, Jake was thrilled at the idea of a whole day of just me and him at home. I woke up at 6 a.m. to check on road conditions before deciding not to go to work, puttered around and did a few things, then went back to bed to enjoy my snow day. Jake got up around 9 and went downstairs to play Legos. Suddenly he was in front of me holding a plate. "You didn't get up, so I thought I'd bring you food," he said, holding a plate of Eggo waffles with syrup. This is single-handedly the cutest thing he has done in a long time. It rarely occurs to Jake that I might have feelings like hunger, thirst, exhaustion, etc - I very often have to explain to him things like "I just got home from work and haven't had anything to eat for 6 hours, so I can't help you assemble a Lego set right now." And his response is usually a blank stare or to try harder to convince me. I'm not sure if he got the idea of bringing breakfast to mom in bed from a T.V. show or he just really wanted to share, but it was adorable. 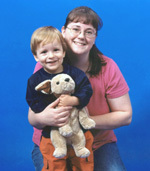 Elkonin boxes - work with CVC words to identify consonants and medial vowels, and learn to sound out words! Includes picture cards and movable alphabet, plus some bonus activities. 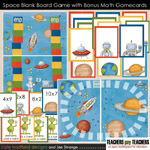 Blank Board Games - customize these games to any content you need to teach! These file folder games are perfect for preschool and elementary schoolers. Includes editable playing cards in JPEG and PDF format. 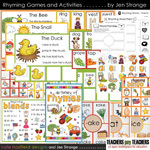 Rhyming Games - learning to hear rhymes and manipulate words is a cornerstone skill for early literacy. 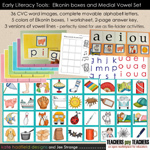 This 10-part set includes posters, bookmarks, worksheets, various games, and a file folder game with accompanying rhyming dictionary. 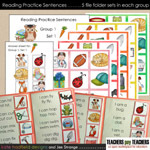 Reading Practice Sentences - do you have students who are struggling with sight word acquisition? Have them spend some time with these file folder games and those sight words will be mastered in no time. 3 different groups available.